Whew, what a meeting! Not only were there fabulous show-and-tells, but we made it through a lot of official Guild business. It must mean good things are ahead when you don’t know where to start. First, check us out on our Facebook page and join in on the conversation. Don’t worry, everything important will still be posted on the blog, but this is a great place to have informal conversations, and it’s a space to grow relationships. Of course, if you share a beautiful project on Facebook, please be sure to bring it to the meeting so that we all can see! This group is members-only, so to join just send a request and Ashley or Melanie will approve it and give you access. After some healthy debate and explanation, we voted to approve our bylaws! They will be available to all members on a private part of our soon-to-be-launched new website. We can amend them at any time with a vote, but they are a necessary part of our organization moving forward. Thanks to everyone for sticking with it and getting them approved. We are super close to filing our official application to become a chapter of the Modern Quilt Guild. We now have an EIN, bylaws, article of incorporation from the state and just need to get our bank account. We will be sure to update you all at the September meeting on the 26th at 7PM. Let’s recap our show and tell! Margy continues to wow us with her creativity and perfect piecing. Her first quilt, a Picnic blanket was inspired by linen samples that she just had. 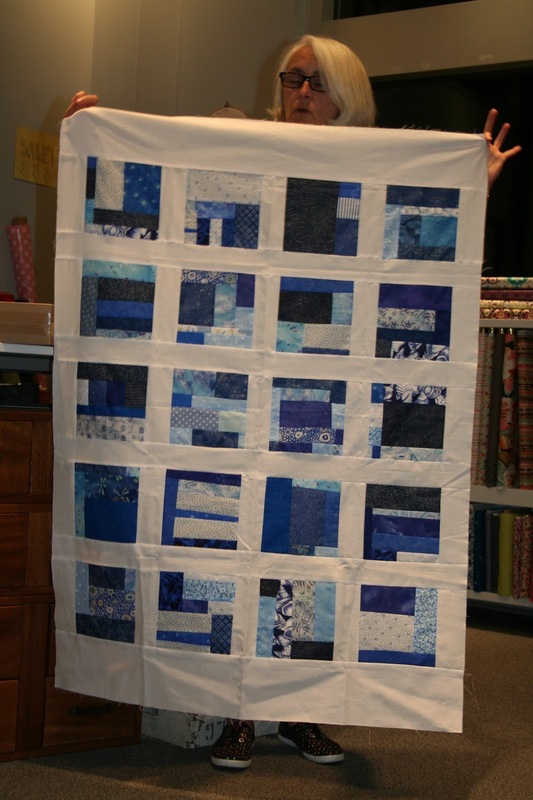 Don’t we all long for a quilt this beautiful from yardage we have laying around? 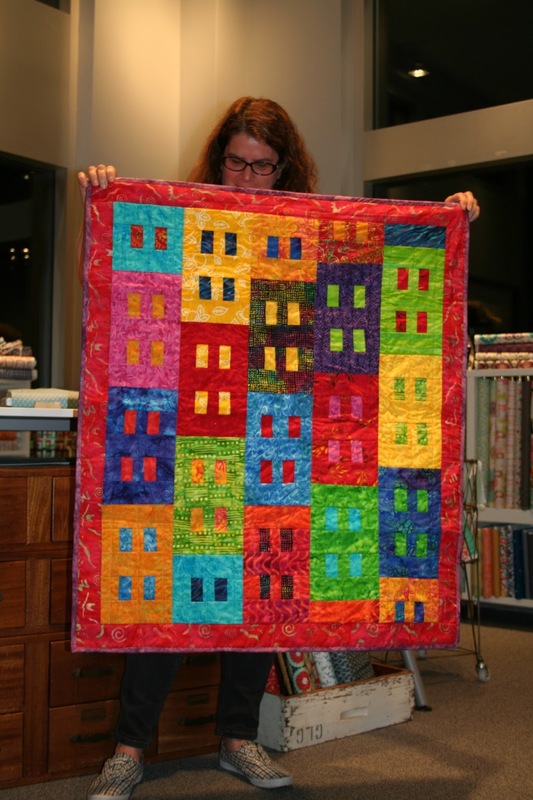 If you thought they couldn’t get more beautiful, check out her next quilt: “View of the City”. 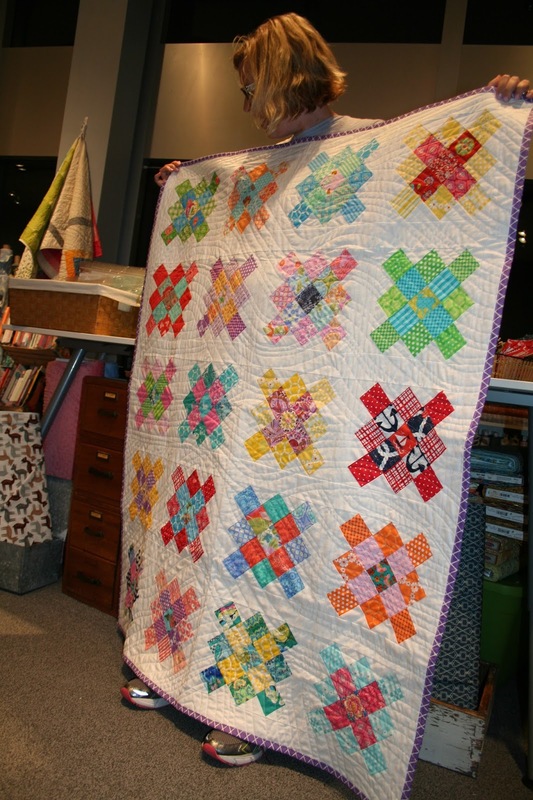 Margy made this quilt top as a part of the Madrona Road Challenge. 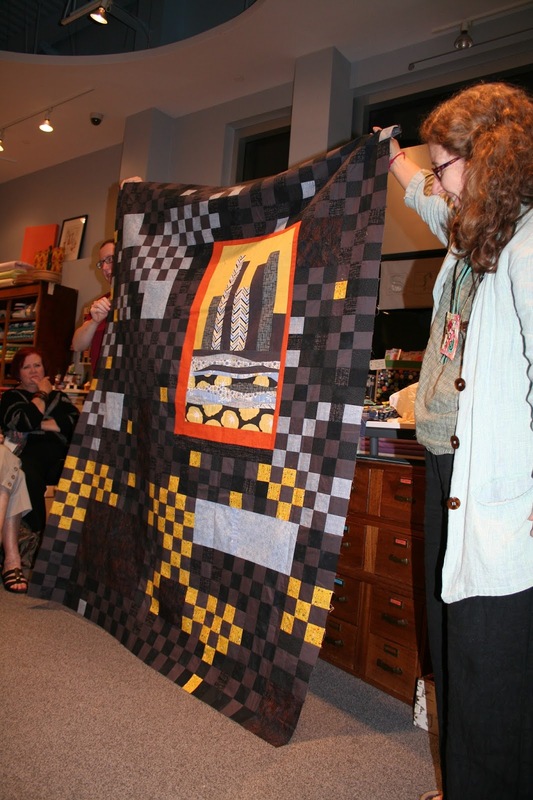 She originally showed us the city scape portion of the quilt, and even though we didn’t think she could make it even more amazing she showed us she could. Simply stunning! Sue brought in a beauty that’s been on her design wall since last September. I’m sure we all agree that we’re so glad it’s done and ready to share! She shared that she loves color and nothing brings her more bliss than just putting color up and seeing what happens. In fact, she can’t remember the last time she followed a pattern. No need to follow a pattern when you create something this spectacular! Ashley brought back her Granny Square quilt that she finished quilting after a summer in North Carolina quilting with her grandparents. Throughout the quilt there are blocks representing family members for the newest cousin. 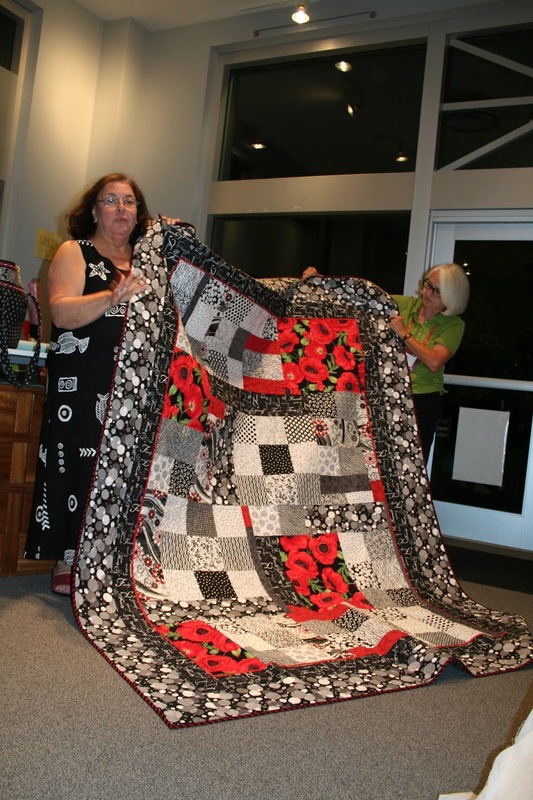 Not only was she celebrating a finish – as a newer quilter, but she was ecstatic that this was the first time she quilted something other than straight lines. In fact, she brought in a few samples of free-motion quilting samples she had been working on and it won’t be long before they show up on an actual quilt! Get ready for this one, folks. Melissa made this beauty in an afternoon. I know. I’m thinking the same thing: share some of that quilting mojo, Melissa! She used a new method for making half-square triangle where you make 4 at a time. Even though she was originally worried about cutting the edges on the bias, she swears it was easier to line up the seams. We all believe you since it came together in an afternoon! 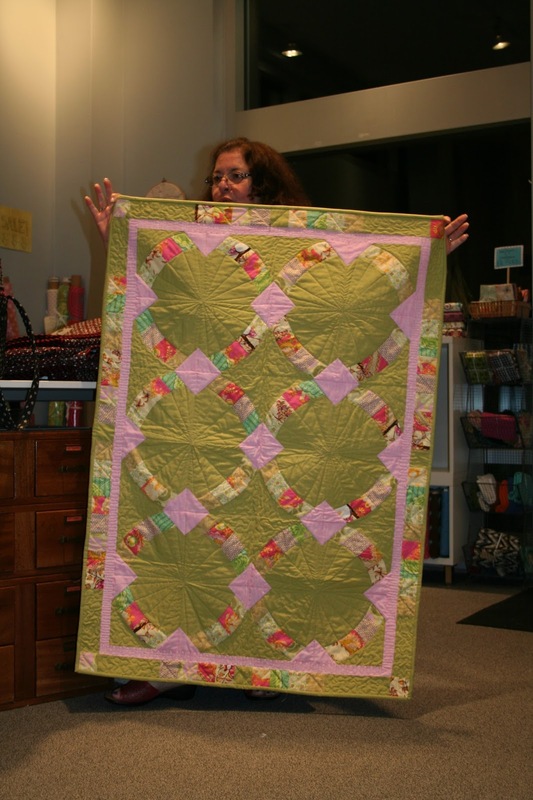 Sue started quilting a year and a half ago in Beth’s class, and there was a challenge to use solids. She decided to create these darling placemats with cups on them! Everyone shared an audible gasp over these adorable placemats, and laughed in appreciate when she said that, “No one is allowed to use them.” We completely understand! Daniela who created our beautiful new logo brought in two Flags she had created. In the first one she used a gorgeous combination of blues and greens, and then wowed us with the second one that she improvised. She says that she cursed in her head and learned so much while creating this adorable flag, but it looks too perfect to be difficult! 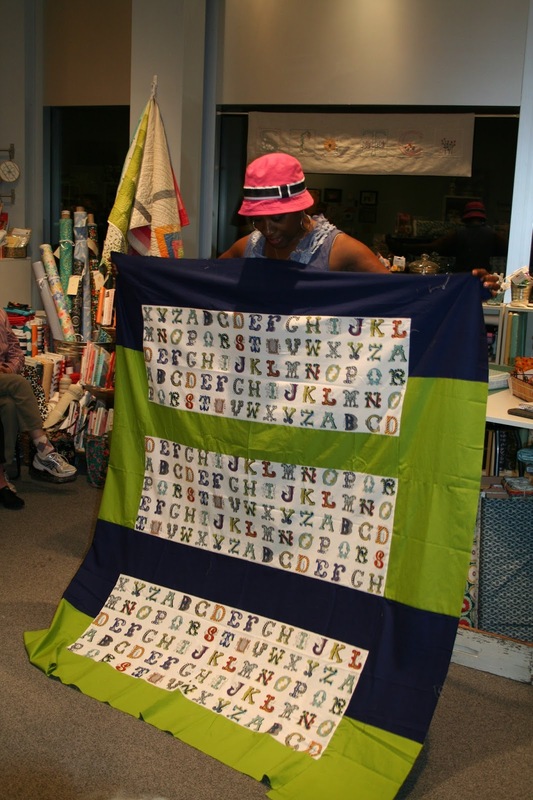 Then, in a moment we all love to see, she shared her first finished quilt! 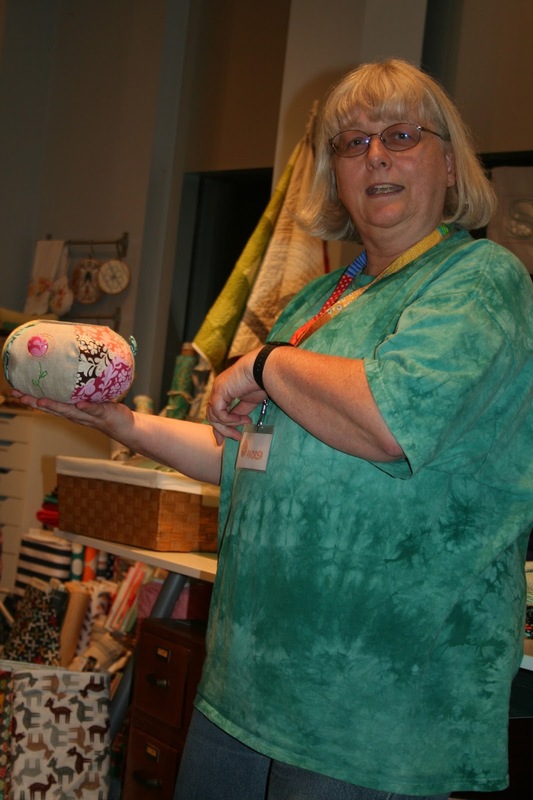 She recently finished Melanie’s Quilting 101 class to “put all the pieces together” and even though her kids love to roll on it, she stated definitively that it’s hers! 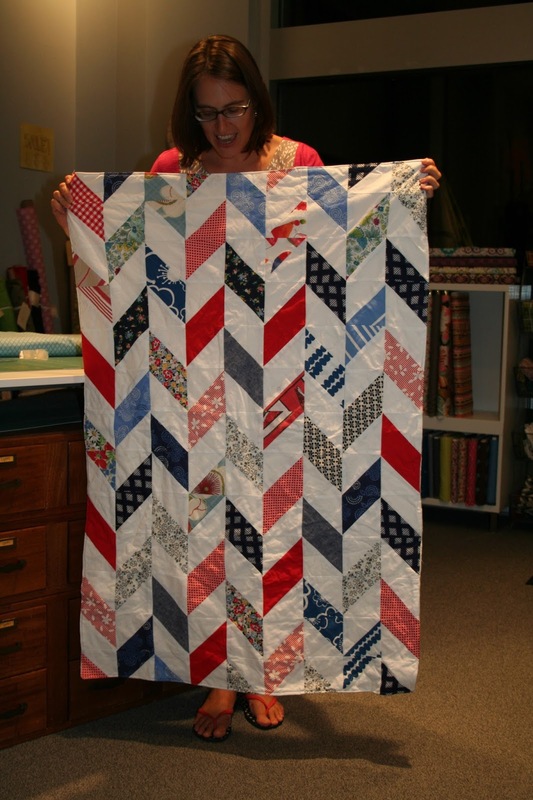 When Amy got up to share this next quilt there was an audible gasp. “The Nest” is a stunning pattern she got from Suchity Such blog – http://suchitysuch.blogspot.com/2013/05/the-nest-quilt-is-available.htmlmade even more beautiful by the solid fabric and circle quilting she chose. She said it’s a mixture of her loves, a glue stick, and a little sewing. We all thought it was perfection. As if it couldn’t get any better, she shared a quilt that has been in various stages of completion for years. She’s been designing it, ripping it out, and starting over for multiple years, and it’s sat in pieces for 2 years in her mother’s house. In fact, once she got the final vision, she snuck into her mother’s house and stole the quilt because she didn’t want her mother to freak out. It’s safe to say that now no one would freak out with this final product! In fact, we couldn’t decide what we liked better – the front or the back. Kourtney also found a quilt her great grandmother had made and now she’s fixing the tacking so that it will continue to be treasured for years to come. 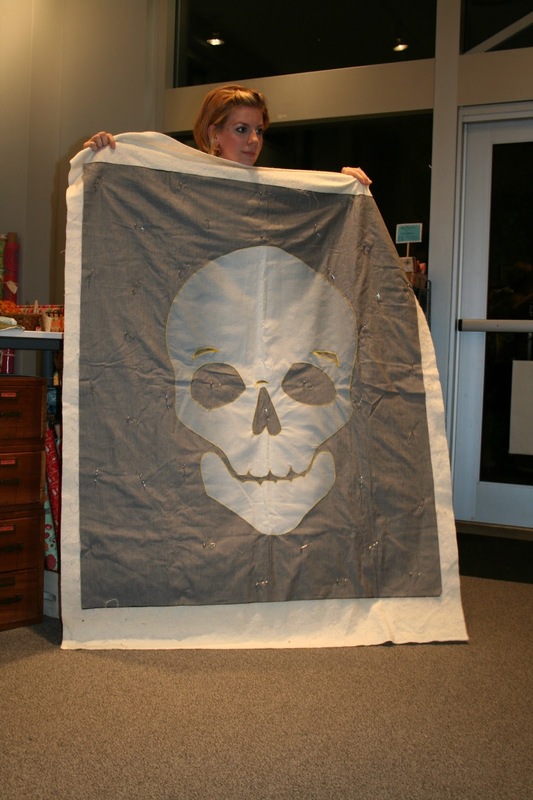 She also showed us the progress on her Skull Quilt, and some of the fabrics on the back are from her great-grandmother’s stash! How special is that? Diane wowed us with her love of bright colors, and she shared that even though she loves bright colors, she tried to tone it down with a black and white polka dot on the back. We all agreed that her choices were perfect on both sides. After looking at her god-child’s registry for her upcoming wedding, JoAnn started working on a quilt using the colors she found on the registry. After creating 4 blocks, she decided, “I can’t give this away.” Her husband thought this was crazy, but after seeing it himself he had to agree. We all decided that we agreed too! Now, with the bridal shower just three weeks away, she made another quilt! We all adored the Poppies and we know the bride will love receiving such a beautiful and thoughtful gift! 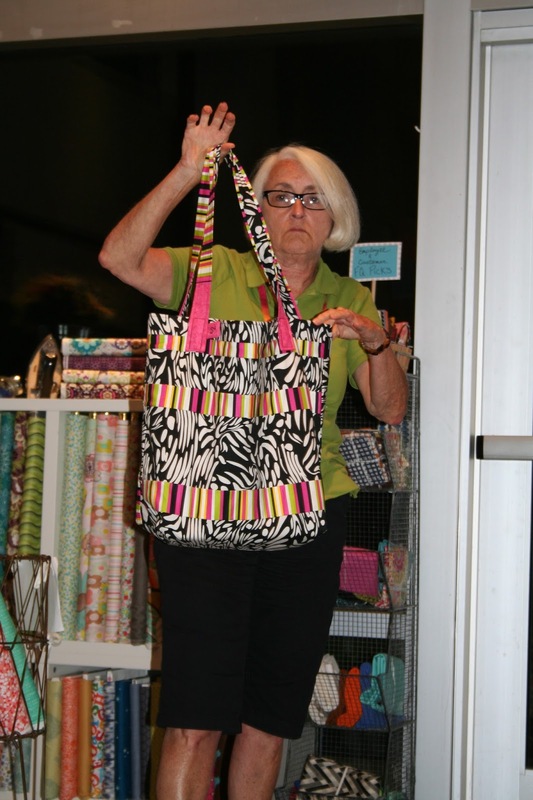 Carol came for the first time and braved the crowd to share her stunning Twisted Sister quilt. Much to our disappointment, the fabrics were all 10 – 15 years old. 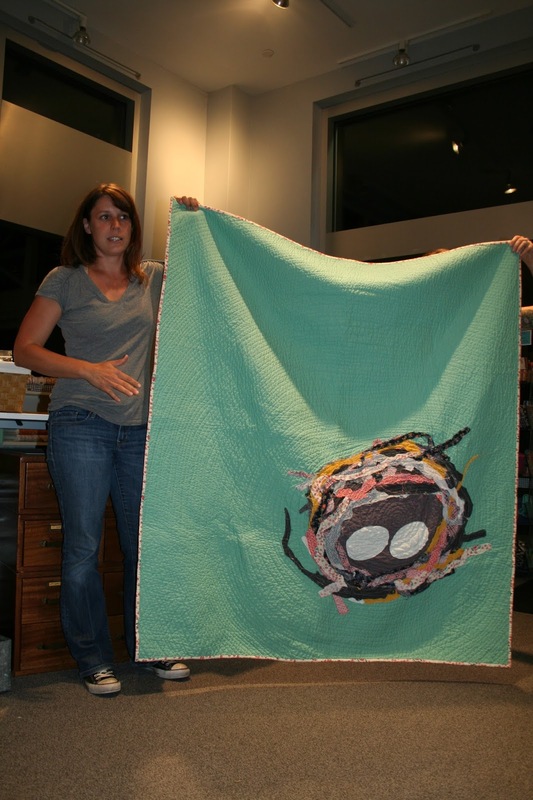 She also shared a beautiful self-portrait quilt that left us all in awe! Of course, we couldn’t help but notice that she sat through the meeting making gorgeous jewelry which means she’s right at home in Rock, Paper, Scissors! Judy shared a wonderful project she made as a “quick project” with another guild and then peaked all of our interest with a box. She promised that we would all want to take it home, and she was right! Of course we all need a vintage sewing machine clock! 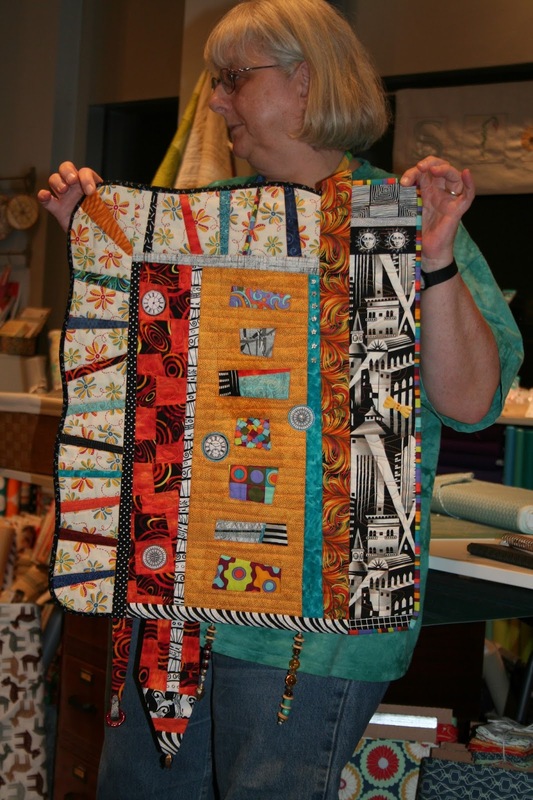 Then she shared a scrap project where she looked through all of her scraps and started creating a scrap quilt by colors. In fact, she’s started a pink one and we can’t wait to see it! Another plus of using your scraps is that you get to buy new fabric! 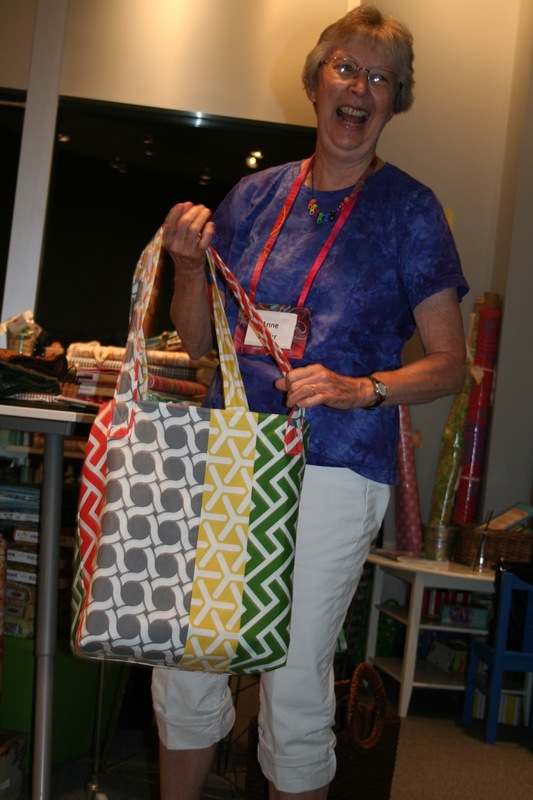 Anne shared her own totes that she created in the same workshop as Judy, which she originally thought she’d donate, but decided it was hers. You made the right choice, Anne! She also shared an adorable wall hanging that’s cute enough to eat. Literally. Then a beautiful guild challenge where you take a photo of yourself, and then extend the photo into the quilt. 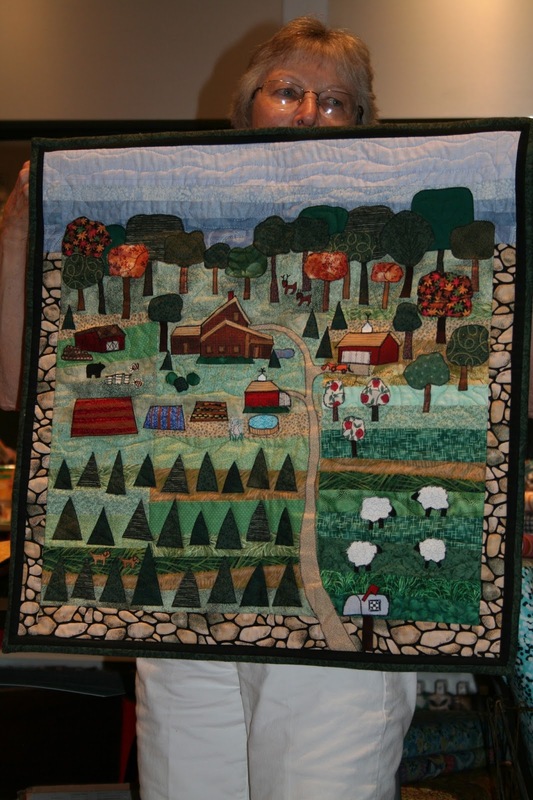 How stunning is this quilt from a photo taken during her childhood at her grandmother’s house? 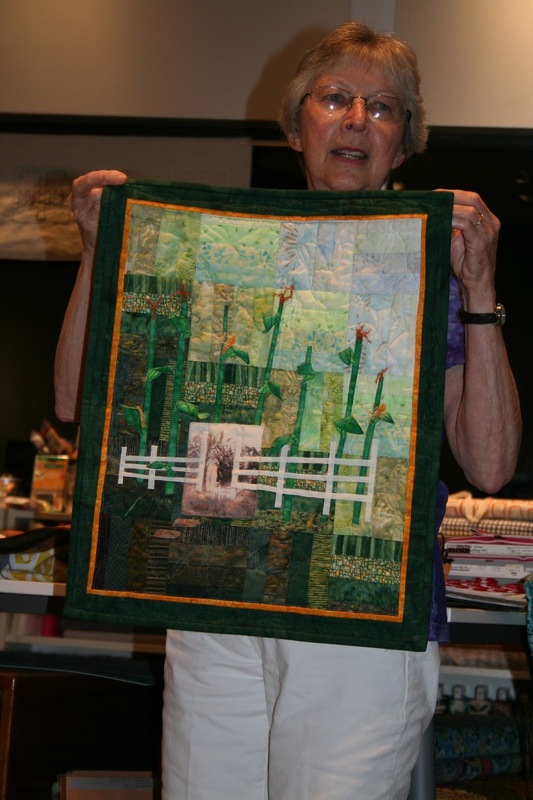 And then, she created a quilt inspired by her own home. I don’t know which one I want to see more – this quilt, or her home. How stunning! Josie continues to wow us with her use of color as she shared the completed top she brought in the first time she came! Her niece can’t wait to receive this quilt and we can’t blame her! For the back, she put all the scraps together, and even though she didn’t have enough of the letter fabric we all agreed that the design was perfect! Andrea shared a genius invention that had us all leaving with envy. She participated in an online swap for pincushions and her partner created one with a center holder! 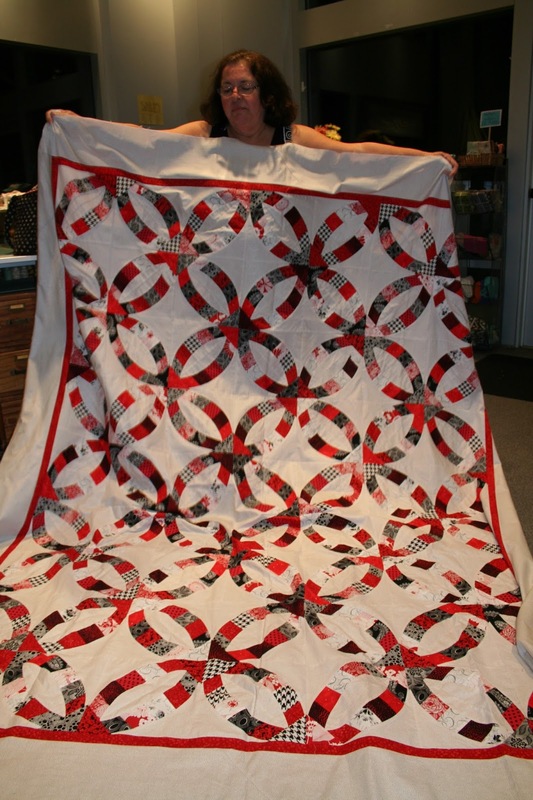 Peggy received an audible sigh from the group when she shared her recent troubles with a beautiful quilt she is making where she used the wrong white for the sashing. After seeing it in the light, it had to go back in the box because, “While it would have been OK when I first started quilting, it’s not now.” We all understood, but can’t wait to see it with the correct white! And, last but not least, Melanie shared her first published pattern! Spaced Out is a free download for Cloud 9 and you all should try it as it comes together quickly and it’s a great showcase for your favorite fabrics. Each month show-and-tell continues to inspire and wow each member. We hope you’re all ready for the September meeting! Be on the lookout for our new website which is coming soon! And be sure to work on those Challenge blocks for The Land That Never Was. Yay!!!! So lovely! Thaks to all the wonderful ladies who made this happen!